Elderly consumers can enjoy any one of several cell phone plans for seniors offered by Consumer Cellular in conjunction with AARP (Association of Retired Persons). The already low Consumer Cellular wireless service prices are discounted by AARP to provide seniors with a flexible range of affordable options. The Senior Value Cellphone (SVC) plan is a Tracfone package plan that bundles a relatively inexpensive Samsung phone with affordable pay-as-you-go service. Designed just for consumers who are 65 or older, the Verizon Wireless Nationwide 65 Plus is a senior-friendly calling plan that comes with 200 anytime minutes and 500 night and weekend minutes. Generally, senior citizens do not require tons of minutes. The AT&T Wireless Senior Nation 200 calling plan is one of the cell phone plans for seniors specifically tailored around that proposition. Based on its simplicity, the Flex cell phone plan by Pure TalkUSA is easily adapted for seniors. With this all-inclusive plan, $10 monthly means just that; the price includes taxes and no additional or hidden costs. GreatCall, maker of the popular Jitterbug, offers several no-contract cell phone plans for seniors. With no cancellation fees, they range from basic plans, to the premium plan, to the simply unlimited. The Senior Value Cellphone (SVC) plan is a Tracfone package plan that bundles an inexpensive Samsung T155G mobile phone with affordable pay-as-you-go phone service. There are no contracts, no activation fees and no monthly bills for this prepaid service and phone coverage is nationwide. The large-keypad, large-display phone is available for about $15 or less. The phone service begins as low as $7 per month; simply buy an airtime card available at over 80,000 store nationwide to add minutes. Also look for Tracfone Double Minutes For Life offers that give you twice the minutes you actually pay for. Designed specifically for consumers who are 65 or older, the Verizon Wireless Nationwide 65 Plus is a senior-friendly calling plan that comes with 200 anytime minutes and 500 night and weekend minutes. The 65 Plus cell phone plan has no domestic roaming or long distance charges and includes unlimited mobile-to-mobile calling to other Verizon customers. Single- and two-line plan options are available. Texting is additional, and only certain phones qualify for the 65 plus plan. Generally, senior citizens do not require tons of minutes. The AT&T Wireless Senior Nation 200 calling plan is one of the cell phone plans for seniors tailored around that fact. The Nation 200 plan offers senior customers, aged 65 and older, 200 anytime minutes, 500 night and weekend minutes plus unlimited mobile-to-mobile calling to other AT&T subscribers for a flat monthly access fee. "We are pleased that companies such as AT&T are developing plans for seniors that enable them to affordably stay connected to their communities, including family, friends, children, grandchildren and physicians, for medical monitoring purposes," said Kristin Fabos, executive director of SeniorNet. Based on its simplicity, the Flex cell phone plan by Pure TalkUSA is easily adapted for seniors. With this cell phone plan for seniors, $10 monthly means just that; the all-inclusive plan price includes taxes and no additional or hidden costs. According to Pure TalkUSA, each month the senior cell phone plan starts at the base level of 101 minutes for $10. As you need more minutes, your account is automatically adjusted to the next level. Leftover minutes never expire; they just rollover. 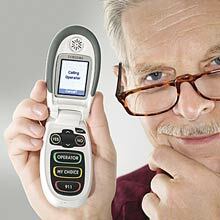 The no-contract Pure TalkUSA senior flex plan is bundled with the Snapfon ez-ONE mobile phone.